Four recently-completed Legacy Libraries to report! 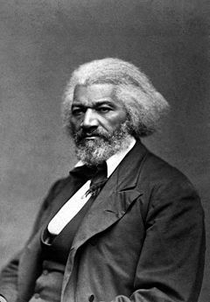 Frederick Douglass – working from a National Park Service inventory of the books at Douglass’ home, Cedar Hill, a small group of volunteers flash-mob-cataloged more than 1,300 books to Douglass’ LT catalog. Thanks to amandafrench, benjclark, Elizabelle, goddesspt2, JBD1, thornton37184, waitingtoderail, and wendellkate for their kind assistance! Douglass acquired an impressive collection of government documents, which make up a pretty hefty portion of his library. Member meburste holds the most books in common with Douglass so far, at 47. Harry Houdini – A large portion of Harry Houdini’s library (which was huge!) is now at the Library of Congress, and we’ve now added that to LibraryThing, along with a few other books in the collections of the Harry Ransom Center at the University of Texas at Austin. Other significant portions of Houdini’s library are not yet accounted for in LT, but we’re hopeful that other information might allow us to fill in some more segments of his very interesting and extensive collection. I’m sure we’ll never be able to add another library so heavily focused on magic and spiritualism! One of the top members with whom Houdini holds books in common? Jackie Gleason. Carson McCullers – The library of Carson McCullers is now at the Harry Ransom Center, which also houses McCullers’ papers. While it’s not quite clear that McCullers herself collected all the different editions and translations of her own works included in her library at the HRC (check out the author cloud), and some of the books in the collection almost certainly belonged instead to other family members, we thought it was still very much worth adding. Not surprisingly, McCullers shares quite a few books with fellow Legacy subjects, including E.E. Cummings, Sylvia Plath, and Ernest Hemingway. 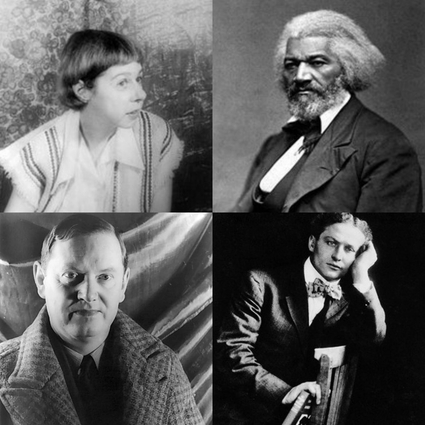 Douglass, Houdini, and McCullers don’t share a single book in common, but Douglass and Houdini share ten books, while Douglass and McCullers share two titles (the Bible and Les Misérables). Further combination work and additions could change this, of course. Just as I was getting this blog post ready to go, I realized that I never blogged about the completion of Evelyn Waugh’s LT catalog back in December (shame on me!). This was accomplished by member jburlinson, who added the titles from July 2010 through the end of 2011. I also added the small, three-book library of Godbert and Sarah Godbertson yesterday afternoon: this is the first joint husband/wife probate inventory in the Plymouth (MA) Colony records, taken in October 1633 after both Godbert and Sarah died in a smallpox epidemic. Other projects continue chugging along! We were really hoping to be able to work on adding the Titanic libraries (there were two, one for first-class passengers and one for second-class passengers), but we’ve had no luck in finding a catalog of the books. If you can help us out there, we’d be very grateful. I know for sure that there are more Houdini books out there, and it’s very likely that more Douglass and McCullers books remain to be added, so if anyone knows of others for these as for any of the Legacy Libraries, please do let me know. NB: Both the Houdini and McCullers libraries were added through a new tool we’ve got that allows for the direct import of MARC records (once they’re in they still need some cleanup to make them display correctly, and often require the addition of copy-specific notes, &c., but this tool certainly speeds along the process). So, if you know of a possible Legacy Library that’s out there in some library catalog, let me know about it and if we can add it directly using this method, we’ll certainly do so! Some more from the Harry Ransom Center are already in the pipeline, for example. Come chat about this Legacy Library update here. Hannah Arendt: LTers pranogajec, rsterling, and mambo_taxi have completed the addition of political theorist Hannah Arendt’s 3,500+ books, which are currently in the collections of Bard College. Graham Greene: Our flash-mob to finish up author Graham Greene’s catalog went very well, and Greene’s 2,500 titles now at Boston College have been completely entered. Thanks to the following LTers for their assistance: g062r (who began the project and added the first several hundred titles), plus ReneeGKC, jjmcgaffey, cinaedus, timspalding, jbd1, cartogis, melmmo, JustJoey4, DuneSherban, mandymarie20, Kaczencja, SassyLassy, flissp, rdurie, melmore, jcbrunner, anglemark, ansate, Wabbit98, UtopianPessimist, urland, arrwa, cpirmann, jburlinson, DanaW. Mark Twain: Now underway as an effort of the Mark Twain Papers & Project, headed up by LTer skgoetz, Mark Twain’s Legacy Library catalog. Watch for new titles! Oscar Wilde: Another Legacy Library now underway: the books entered so far are based on Thomas Wright’s book Oscar’s Books, with many more to come from other sources. LTer JDEllevsen began this catalog and will be augmenting it with additional data over time. On the Libraries of Early America front, I recently finished up the library of Richard Henry Lee. He’s the 20th Signer of the Declaration of Independence with a completed LT library (see the full list here). And I’m currently going through a large database of 17th and 18th-century probate inventories from York County, Virginia to add information about libraries there. More data about early libraries continues to arrive every day! Many thanks as always to all those helping out with the Legacy Libraries. For more info or to find out how you can help, see the homepage. Flash-mob catalog Graham Greene’s library! Flash-mob time! 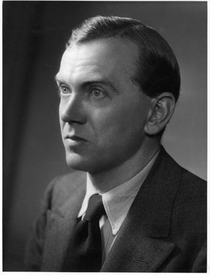 Help us complete the Graham Greene Legacy Library catalog by assisting with the addition of the ~2,200 remaining titles. Greene’s library, now in the collections of Boston College, is notable for the number of books containing Greene’s annotations and marginalia. Many thanks to LTer g026r for getting this project started! See the wiki page for details on how to help, or discuss on the Talk thread. Legacy Libraries 2.0: lists, clouds, and more! It includes the ability to search the contents of Legacy Libraries (LLs) as a whole or by selected subsets; you can also browse LLs by category (like Authors or Signers of the Declaration of Independence), and see a whole series of clouds about the libraries. For each category of Legacy Library, like Authors, we’ve added new status markers (complete, in progress, proposed, unitemized), and you can sort each list by status, name, date, or library size. We’ve also integrated data about the Legacy Libraries into a slightly modified version of Common Knowledge, so each library, regardless of completion status, now has an LLCK profile (here’s John Adams’) containing data about the person and their library (largely for cloud-creation purposes, among other things). Feel free to augment this data, but please do read the help page first, since there are some differences between this and the way other CK edits are done. Any questions, just let me know (jeremy@librarything.com, or jbd1 on LT). This LLCK data allows us to do some really interesting things, like display proposed and unitemized libraries well for the first time (example) and also keep better track of project status. We also, at long last, have a way to highlight the many members of LT who’ve worked so hard on these projects over the (nearly) four years we’ve been cataloging Legacy Libraries (see the contributors cloud at the bottom of the page). You’ll also notice some integration of these new features on profile and author pages, and Chris has whipped up a handy “Featured Legacy Libraries” module for your homepage (by default at the bottom of the right column). For more on this, see the Talk thread, and as always, let me know if you have data on a library we should add or further information about any one already on our radar. Submissions of library data are always welcomed and appreciated! The library of C.S. Lewis (2,166 books) has been cataloged from the holdings of Wheaton College (IL), where it is now housed, thanks to the efforts of BOB81, bokai, cnb, DisassemblyOfReason, iowaboy277, janepriceestrada, MrsBond, and zwoolard. His top shared libraries (weighted) are rwb24 and jfclark; among the other Legacies his collection most resembles those of T.E. Lawrence and Robert Graves. Check out his author cloud too (lots of G.K. Chesterton, F. Marion Crawford, Roger Lancelyn Green, and George MacDonald). Since November 2008 a small but very dedicated team of users (jcbrunner, LolaWalser, GirlFromIpanema) have been working on the very large collection of Thomas Mann’s books, now held (mostly) at the Thomas Mann Archive in Zurich. That project is now complete, with a grand total of 3,282 titles (the largest chunk of which were by Mann himself, with Strindberg, Nietzsche, and Goethe also well represented – see the full author cloud). Mann’s top shared LT libraries (weighted) are Hughie2 and suedwind2. Another interesting recent completion is the addition of the known books read by/belonging to Emily Dickinson (163 titles). Though we know Dickinson read and probably owned many more books, these are those most closely associated with her. This project was undertaken by nbt00, and completed by benjclark. 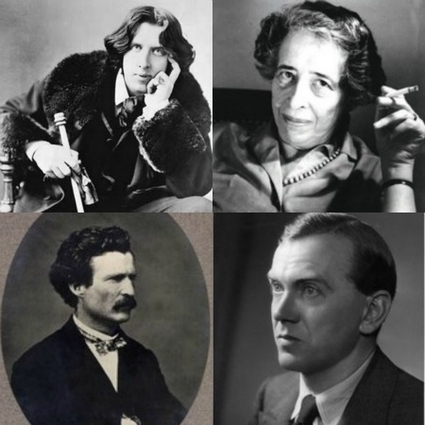 Dickens, Charlotte Brontë, and Edward Hitchcock are the names that pop out of her author cloud. Dickinson’s shared libraries are heavily skewed toward other Legacies: the Mordecai Family, Herman Melville, and Dante Gabriel Rossetti top the list (top shared among non-Legacies is Django6924). Another long-running Legacy project was William Butler Yeats, whose catalog eventually amounted to 2,284 titles. Assistance for this was provided by Tim, michael_p, mountebank, inge87, and myself (JBD1). 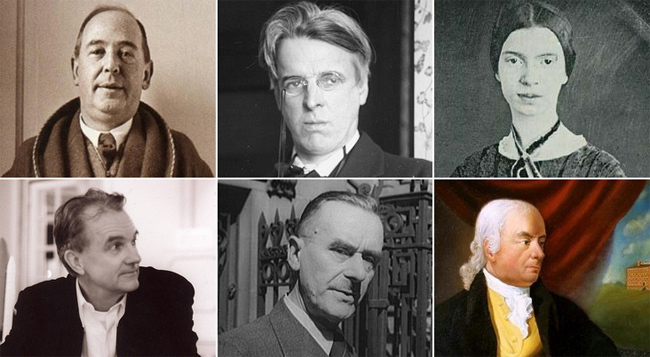 Yeats also had many copies of his own works; other well-represented authors include Rabindranath Tagore, Arthur Symons, Ezra Pound, John Masefield, T.S. Eliot, and William Blake (author cloud). Like Dickinson his shared libraries are weighted toward Legacies, with Lawrence, Lewis, and Alfred Deakin leading the pack. In November some of us got the opportunity to work on a special flash-mob catalog project for a living author: the research library of Edward Tufte (197 titles), which was sold at Sotheby’s on 2 December. Professor Tufte graciously allowed us to add the titles (which include some really amazing works) to LT, which we were happy to do. Catalogers included thornton37814, Katya0133, jcbrunner, jburlinson and me. As far as the Libraries of Early America project goes, I’m focused at the moment on the Signers of the Declaration of Independence in an attempt to find library information for all 56 of them. You can track progress on the project wiki: so far fifteen libraries have been entered, I have full or partial lists for eight more that I’ll be adding, and there are still a few outstanding queries. Recent additions include Stephen Hopkins (RI) and George Taylor (PA). If anyone has individual books or sources to add to this list, I’ll be delighted to know of them (and if you live in Philadelphia or Annapolis and want to undertake an LT-mission, we’ll be happy to reward you for your efforts!). The list of Legacy Libraries in progress remains impressively long; if you want to join in, please do! Contact the LTer listed on the page, or me, and we’ll be happy to get you started. If you have a potential Legacy you’d like to get started on, or want to chat about the projects, come on over. Then and now photos of the White House Library. (“Now” photo by Flickr user Jay Tamboli). The library, WHLibrary1963, contains some 1,700 books. It joins some 128 other “Legacy Libraries” cataloged or being cataloged by members. It’s our second Kennedy-themed library, after the incomplete JohnFKennedy—or third, if you count Marilyn Monroe‘s (interesting) collection. Why We Did It. An amusing train-wreck of blog outrage moved us to action. Rob Port, a conservative radio host and blogger took a White House tour and spotted some books on the wall that made him jump. Hearing or mis-hearing that the books had been picked by Michelle Obama, Port blogged Photo Evidence: Michelle Obama Keeps Socialist Books In The White House Library. 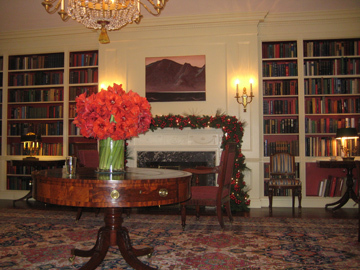 The White House Library.The Washington Post‘s Short Stack blog knocked down the story. Far from being picked by Michelle Obama, the library was in fact assembled at the request of another First Lady—Jacqueline Kennedy. 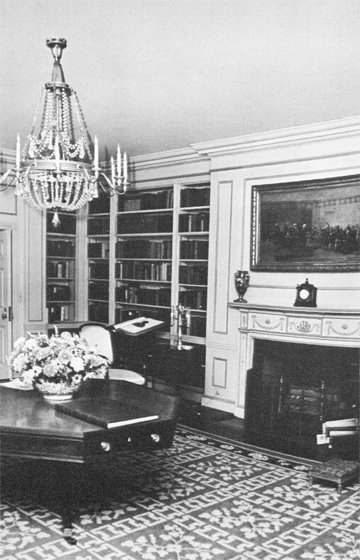 Kennedy, who also oversay the redecoration of the room itself, delegated the selection to Yale librarian James T. Babb, who convened a small committee, including the editors of the Jefferson and Adams papers and the Kennedy aide and historian Arthur Schlesinger, Jr. The work took about a year. The book list was published in the New York Times in August 1963. A limited edition Short Title-List was printed in 1967. Between 1963 and 1967 a number of books were added to the list. From some Flickr pictures, it looks like a few more books may have been added—perhaps in the Johnson administration?—to the actual library. What does it mean? While not a window into Obama’s book tastes, still less his socialism, the library is a window into something. Browsing through it, I can’t help feeling a sense of the time, and of the opinions and culture of the men who assembled it, and were intended to use it. As I see it, Kennedy’s administration was marked by a rare embrace of intellect, ideas and even scholarship, but was also constrained somewhat by the mental world of contemporary east-coast elites—the “Harvards” that irritated Johnson so much. Although flattened by politic initial choices—it includes no living authors of fiction, and few works by non-US citizens— the 1963 White House Library was, in a sense, the library of the “Best and Brightest,” and it reflects their world view. As fun as it was to do, it’s perhaps a shame we don’t have similar collections for all the presidents since then. However interesting, it would be a shame if the White House Library forever remained a 1960s relic. Come talk about the library here. Continuing cataloging and cleanup progress here. 1. amba, ansate, bell7, bokai, carport, cbl_tn, ccc3579, clamairy, cpirmann, jbd1, jjlong, merry10, moibibliomaniac, momerath, SilentInAWay, spookykitten, theophila, timspalding, thornton37814, UtopianPessimist. 2. I kicked it off by driving from Portland down to the University of New Hampshire, which had the closest copy of the limited-edition Short-Title List. I love that my job periodically allows me to get in a car for the sole purpose of getting a book at some far-away library. There’s a minor tempest-in-a-teapot brewing over the White House library. Apparently a conservative blogger on a tour took a snapshot of some socialist-oriented books, misheard that Mrs. Obama had selected them, and blogged about it. They turned out to have been selected by Jackie Kennedy, or rather by a prominent Yale librarian she selected, and to have been there since the early 1960s. I’m driving to the nearest copy of the library’s list (published as a limited edition book), and we’re going to use it as the basis for a Legacy Library. This is minor hot news, so I think we should try to do it fast. Any many hands make light work. Let’s see what an insane pack of bibliophilic historians can do. We’re going to virtually flash-mob the library, by adding books from the list to a LibraryThing account at the same time. Once I have pages, I’ll start posting them, and anyone who wants to help, can help! Read more about the project and join us.